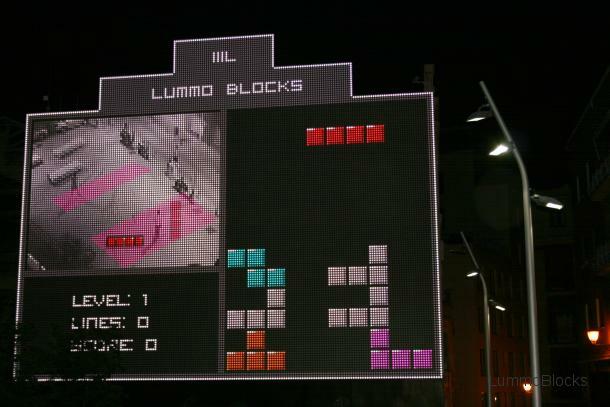 LummoBlocks is inspired by the legendary ‘Tetris’ game and designed to create social interaction between people in the public space where a digital facade is used to visualise the game. 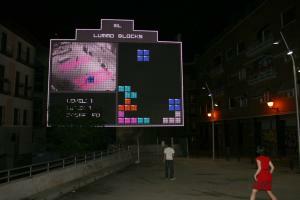 The mechanics of the game are similar as in ‘Tetris.’ Players must try to solve the largest possible number of lines in order to prevent the stacked pieces from reaching the top of the screen. The aim is to create a playful interactive space located experience. 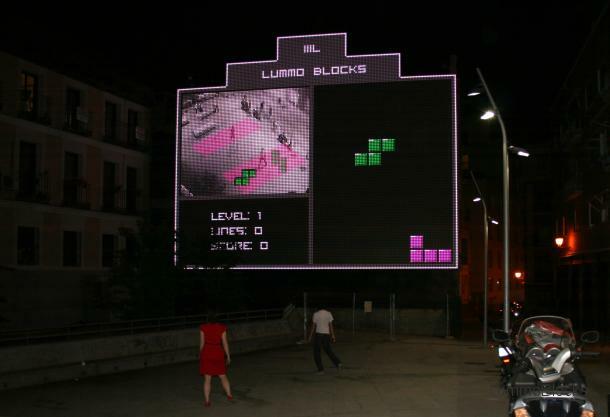 Lummo team - Carles Gutiérrez, Javier Lloret, Mar Canet and Jordi Puig - is a group of friends, artists, and professionals working together to create interactive spaces using a creative approach with the technology and developing different new media arts concepts. They work in multidisciplinary projects intersecting many fields such as architecture, electronics, graphic, interaction, information and industrial design as well as computer generated graphics. Now they play with architecture to activate public spaces, mixing digital and physical design focused on interactive spaces. They have shown art projects in Ars Electronica Festival (Linz), FILE (Sau Paulo), Node festival (Frankfurt), Stuttgart Film Festival (Stuttgart), Robot Festival (Bolonia), El Grec (Barcelona), SantralIstambul (Estambul), [e]Star (Lima), Observatori (Valencia), Innmotion (Barcelona), Cellsbutton#03 (Yogyakarta), Cinemacity (Novi Sad). Collaborators: Fabiana de Barros, Francesco Ozzola, Montfagüe F. Lavandera, Nacho Cossío, Óscar Mora, Max Neupert, Sebastian Hundermark, Nenad Katic, Nina Valkanova and Abraham Manzanares.